Glyphius 2007 contains a built-in database of over a hundred thousand profitable and unprofitable ads. It allows you to score your own ad copy against this database for profitability. It's really simple. You just copy/paste a headline, sentence, order link, Adwords ad, resource box or any other copy that is meant to sell into the edit box in Glyphius 2007. Once you do that, you click the "Score" button. In milliseconds, thousands of words and punctuation are compared to the internal database and scored. As far as you can tell... INSTANTLY, you see the score right under where you typed. If the text you just typed scored higher than any prior text you typed and scored in this session, your text is also copied to the top of that screen so you can see the winning text at all times. Change a single word. If it scores higher, the new winner will go up top. Try putting an exclamation point at the end of the sentence instead of a period. If that scores higher, your text gets copied to the winner's box. Keep working on any text as long as you would like. When you are happy that you've tried everything you can think of... just copy the winning text from the top and paste it wherever it goes. Just think about the money and time you can save testing new headlines and ads. Just think of the money you are about to earn from increased sales. So let's recap. 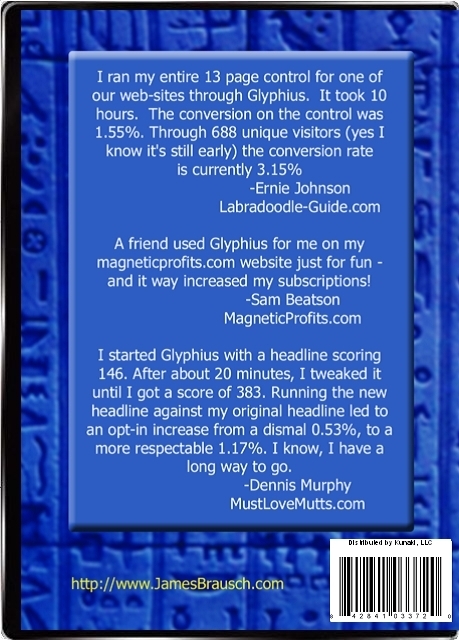 The Glyphius 2007 software has a built-in database of profitable and unprofitable ads. The software simply boils down your ad copy, headline, or any paragraph of text into a simple score showing you how much your ad is similar to profitable ads and different from unprofitable ads. Glyphius 2007 is in stock and will be shipped immediately after you order. Since the data is built in, you can score your first ad just seconds after you install it. It's as simple as typing in some text and clicking the score button. So go ahead and click the order button below and get started. System Requirements: Windows XP, 2000 or 2003. You will need Internet Explorer, a sound card and speakers to watch the training videos.